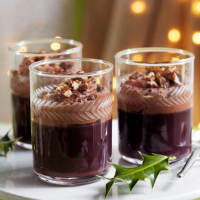 This delicious dessert is packed with Christmas flavours. It is also perfect for entertaining as much of it can be prepared in advance. 1. Squeeze the juice from the Clementines (about 300ml) and mix with the wine, mulled wine sachets, sugar and 300ml water in a large saucepan. Bring to the boil and simmer gently, covered, for 10 minutes. 2. Meanwhile, soak the gelatine sheets in cold water for 5 minutes. Drain well. Remove the wine from the heat, add the gelatine and stir until completely dissolved. Allow to cool before pouring into 8 wine glasses, then chill for 3-4 hours until set. 3. Melt the chocolate and butter in a large bowl over a pan of simmering water. Whisk the cream to soft peaks and gently stir into the chocolate mix. Spoon over the mulled jelly and serve, scattered with chopped pecans, if you wish. You can prepare the jelly up to 4-6 hours ahead and then simply top with the ganache before serving.